I am going to try something new on WWMB today and for the next few months. A monthly giveaway. This all started when I was contacted by my friend Lee Koven. Lee is a fellow SFR Galaxy Awards judge and once she joined me for a joint interview with a favorite author, Bec McMaster. We have very similar taste in great books! Lee loves to explore cultural, technological, and human possibilities, so she also loves to read and discuss science fiction romance. Her other hobbies include music composition, playing and making video games, and writing. A computer programmer and server admin by trade, Lee resides near Boston with her partner and many robots. Lee likes print books but once she has read them, loves to share them. So she asked if I wanted to do a monthly giveaway for her like-new and gently used books that a Whiskey With My Book follower might enjoy. Sound good? Yes! For each giveaway, I will be adding an MP3 audiobook to the prizes to be won. So put down your e-reader, walk away and cross your fingers. There will be one print book winner and one audiobook winner. The contest will be open for two weeks. Feel free to share with your friends. Due to postage costs, the contests will be open to folks with a US or Canada mailing address. The first contest book is actually two Scifi Romance books: The Rule of Luck and The Chaos of Luck by Catherine Cerveny. The Rule of Luck is the winner of two SFR Galaxay Awards. These are the first two books in what is so far a three book series, Felicia Sevigny. I thought they were great (click on titles for my reviews), mostly because of the highly original plot! The third book in the series, The Game of Luck was recently released and is on my TBR list. The contest audiobook is Phantom Evil by Heather Graham. Ms. Graham’s Krewe of Hunters books are a cool combination of contemporary mystery solved by traditional detectives and a bit of the paranormal. Phantom Evil is actually the first book in the series. I have read a few more Krewe books and found they are all standalone, no cliffhangers and each a very good story. Great for Halloween season! Note: There are four chances to win, each is labeled ‘Invent Your Own Option’. You don’t really have to invent anything. I already did that. Go ahead, give it a try! One year ago today, Whiskey With My Book was born. It has been quite a year, not only from a blogging standpoint, but also from a personal perspective. While many looked back a 2016 at the end of last year, I thought the WWMB birthday was just as good a day to do that. A year ago, I nervously clicked on the ‘Publish” button and my very first post went live. It was a review of The Viper and the Urchin by Celine Jeanjean. It was also the start of a lovely reviewer/author relationship with Ms. Jeanjean. The title of the book was later changed to The Bloodless Assassin and the series became know as The Viper and the Urchin. Since then I have read and reviewed two more additions to the series, The Black Orchid and The Pickpocket. 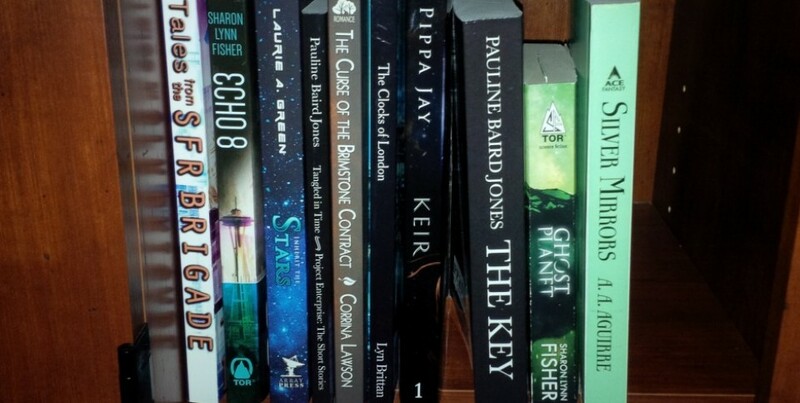 Some of my early posts were my ‘On the Bookshelf’ posts, in which I feature the books that appear in my blog header photo. All are among my favorite books and the authors are all exceptional: Pauline Baird Jones, Laurie A. Green, Corrina Lawson, Lyn Brittan, Pippa Jay, Sharon Lynn Fisher and A.A. Aguirre. At the end of January came the 2015 SFR Galaxy Awards. I was thrilled to be asked to be a judge for these awards. There are so many books that I truly enjoy for one reason or another. The SFR Galaxy Awards is just another way to bring these books to the attention of those who enjoy reading SciFi Romance. The awards themselves might be a bit quirky (for example, I gave Echo 8 by Sharon Lynn Fisher the award for Best Physics Lesson) but all the books I selected are great stories written by the best storytellers. The 2016 SFR Galaxy Awards are coming soon. I’ll have a post about them here, or you can follow the SFR Galaxy Awards blog by e-mail. In February, I added art to the blog. I have always been a very visual person, so adding art seemed natural. Plus, Alana McCarthy of Geeky Pet created a Doctor Who cat. Art. SciFi. Doctor Who. Cat. To celebrate St. Patrick’s day, I featured more art. You may have seen some of the Jameson Irish Whiskey ads on TV. The ads and the art are very entertaining. Goodreads told me I was a top 1% reviewer in April. I really don’t know what that means – exactly. Still it is kind of cool! Several Prism Award finalists where featured on Whiskey With My Book in May and June: Sandy Williams, Donna MacMeans, Debra Jess, Aidee Ladnier, M.A. Grant, Angela Quarles, Sharon Lynn Fisher, and Michelle Diener. This award appeals to me because it is all about the genres that I really enjoy reading. The end of June also saw the final post of the blog Smart Girls Love SciFi Romance. I had been a contributor to this awesome blog since May of 2015 and because of everything I learned working with founder Charlee Allden, SGLSFR was indirectly responsible for my creation of Whiskey With My Book. Beginning in August, WWMB became part of the excitement leading up to the release of the Pets In Space anthology (PISa). We featured PISa several times over the following months, including a guest post from author Laurie A. Green, author interviews, PISa art (reblogging from Veronica Scott’s post) and finally my own review of Pets in Space. KJ Van Houten joined WWMB as a review contributor in August. I am absolutely delighted to have her fresh view of books on this blog. Also in August, Lee Koven joined me in a joint interview of Bec McMaster. Lee and I share some very similar taste in fiction, with Ms. McMaster being a favorite. It was a really fun interview! Star Trek turned 50 years old this year. Star Trek had a huge impact on my scifi tastes in books, TV and movies. What a remarkable series, in all its iterations. I also met an author/blogger who enjoys Whiskey as much as me, though Sorchia Dubois spells it W-H-I-S-K-Y. She stopped by for a guest post and discussed the merits of single malt scotch. I discovered several new to me authors in a variety of genres and I don’t have enough time to read their entire backlist. You know how that goes. So I will just attempt to keep up going forward. Brenda Cooper, Celine Jeanjean, Christina Westcott, Gill McKnight, Catherine Cerveny, Genevieve Cogman and Mark E. Cooper. And as much as I love to discover new authors, WWMB loves repeat visitors! Several authors were featured more and once in once way or another (book feature, author interview, or guest post: Cara Bristol, Veronica Scott, Juliette Cross, Laurie A. Green, Liza O’Connor, Susan Grant, Sharon Lynn Fisher, Michelle Diener, Cecilia Dominic, Celine Jeajean. On the personal side, 2016 led to a couple of major changes. At the end of January, I retired from a long career in IT and Banking. Happy to be free of the demands of a constantly and quickly changing environment, I eventually found myself looking for something else to do. More of part-time, low stress job to keep my mind occupied. In June, I found that job. I call it my dream job actually. The local city library needed a new Library Director. It’s a part-time job with very few benefits, but… It. Is. A. Library! Plus I work with book-lovers and books. This year, I will be going through the State Library of Iowa Public Library Management program, so it’s back to school for me. I am really looking forward to it! Cats were mentioned in at least 20 posts, probably more. Even my cats got to visit once. Friday is my most popular day for visits. The weekly ‘What Are You Reading This Weekend’ features art and the current book(s) I am reading. I’m not sure if the popularity is because of all the art lovers out there, or there are many folks looking for something to read. To all the authors that have been a part of my blog this year. I would not be here if it weren’t for you and all those wonderful stories you tell. I have truly enjoyed working with all of you, whether it was a book review, feature, interview or guest post! I hope we can work together again. And to WWMB’s followers: as of the draft of this post, we have 230 followers. Whatever your reason for following – art, books, whiskey, cats….. – I truly appreciate it when you stop by and read what I have written. Thanks for reading!